RetroChallenge Half-TIme Report | What's All This Brouhaha? Although I got the LTP-305HR dot-matrix LED multiplexing working, it doesn’t look anywhere near as nice as the original HP 5082-7340 or TI TIL311 hexadecimal displays. I’ve decided to drop my original plan to use the LTP-305HR displays, and use the hexadecimal displays instead. Broadcom (previously Avago, previously Agilent, previously HP) does still make similar hexadecimal displays, though without the red filter. They are quite pricey. The board will accept either the HP 5082-7340 or TI TIL311 displays, using interleaved footprints. The board can be stuffed with just the traditional two digit data display, or can additionally have a four digit address display. The I/O ports are a USB port (providing JTAG programming and a virtual UART) on the Cmod-A7 FPGA board, a MicroSD card, a TIA-232-F serial port, and an RCA jack for monochrome composite video. 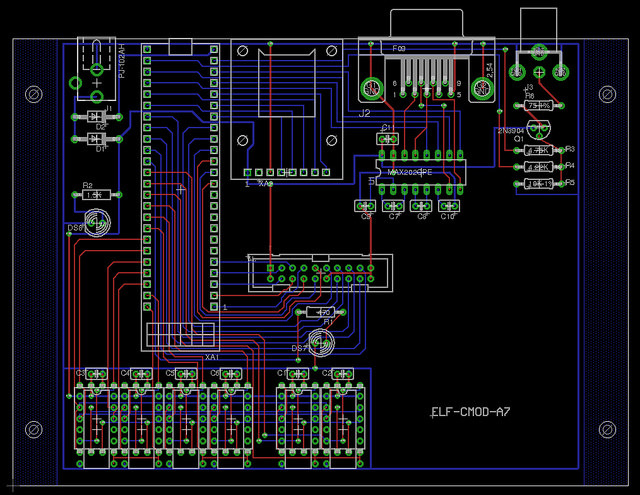 This entry was posted in FPGA, RetroChallenge. Bookmark the permalink.